Different crews of firefighters split up the city and were sent all across Portsmouth to service various fire hydrants. Every year, the fire hydrants of Portsmouth Ohio need a little tender love and care. Thanks to the Portsmouth Fire Department, all of the hydrants are painted and checked on to ensure they’re in proper working order. Different crews of firefighters split up the city and were sent all across Portsmouth. Two of these guys were Aaron Rawlins and Kyle Moore. They were taking care of the hydrants near Mound Park. Taking care of every single fire hydrant is no small task. It is a team effort. Ensuring the safety of Portsmouth residents is very important to the Portsmouth Fire Department. Spending countless hours outside in the heat isn’t usually fun, but these gentlemen were doing it with smiles on their faces. Make sure to thank a firefighter if you see them out taking care of the community. 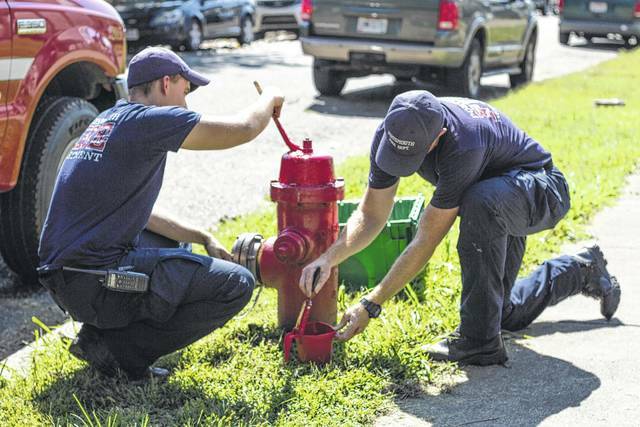 https://www.portsmouth-dailytimes.com/wp-content/uploads/sites/28/2017/09/web1_rsz_img_9992.jpgDifferent crews of firefighters split up the city and were sent all across Portsmouth to service various fire hydrants.